LACKTOPIA is a multi-purpose installation by Madrid-based ENORME Studio. It was realised with elements that are easy to find, low cost and entirely recyclable to decorate LA NAVE, a former Boetticher factory that today has become an important and innovative hub in Madrid. The creativity of the ENORME Studio architects is well known to our readership. For years, the Spanish creative team, winner of the Next Landmark 2015 (link), has been creating design proposals ranging from space-making to urban furniture, with an eye to social and environmental sustainability. Their latest intervention was created for LA NAVE, an industrial building dating from the 1940s and designed and built for Boetticher y Navarro by engineer Eduardo Torroja. This building, in the district of Villaverde, ceased its activities as a factory in 1992. Today, with its over 13,000 square meters, this structure is a public space hosting many events where innovation, dissemination of new technology and collaboration between social partners represent an engine of growth for the city. At the end of April, the Global Robot Expo took place in La Nave. For this event, a stand was needed to host meetings, conferences, debates and professional visits. Of course, on a limited budget. 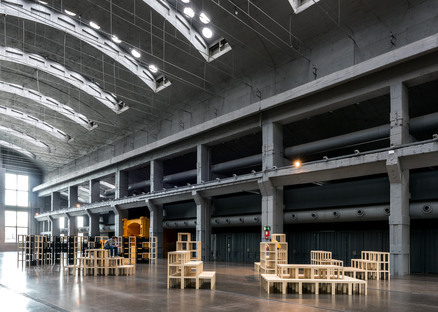 Moreover, at the end of the Expo, the elements of the installation were to be reused as furniture at LA NAVE, a space devoted to entrepreneurship and innovation. ENORME Studio accepted the challenge with a rather unusual proposal, which did not include self-built elements, and that was based on a domestic pop icon of the past ten years, Swedish IKEA’s LACK table. This long-seller was created in 1980 and today, it still sells around 9 million pieces a year, over 300,000 of which are sold in Spain. Since the very beginning, ENORME Studio thought of using hundreds of LACK tables as modules to create small groups of 10 or 20 tables that, combined with one another, could give life to an infinite number of creations: a grandiose pyramid structure, smaller stands, benches, stairs and towers exhibiting corporate banners and posters. A standardised element that is easy to find, has a low cost and can be reused in other creations or structures without special adjustments or processing was the perfect way to meet the needs of the final clients. As the ENORME Studio architects say, this design solution is easy to create, as it is realised with a single, industrial-production table that, thanks to its essential shapes, offers an endless series of alternatives. To create intelligent and sustainable proposals, it is not necessary to reinvent the wheel: with its innovative use of traditional elements, LACKTOPIA, by ENORME Studio for LA NAVE, is a perfect example of this.